"This dish is great served with my Lamb Tagine and Cucumber Raita also on this site." Place a large, heavy bottomed pot over medium heat. Stir in the cumin, ginger, cloves, cayenne, cardamom, coriander, and allspice; gently toast until fragrant, about 2 to 3 minutes. Stir in oil and onion, cook until softened. Stir in the bell pepper, and zucchini; cook for 5 minutes. Stir in the raisins, salt, zest, and garbanzos. Pour in the chicken broth and orange juice; turn heat to high and bring to a boil. When the mixture is boiling, stir in the couscous and remove from heat; cover, and let stand 5 minutes. Fluff with a fork, and fold in chopped mint. The spices were good but I needed to add a little balsamic for additional flavour. Very good recipe. 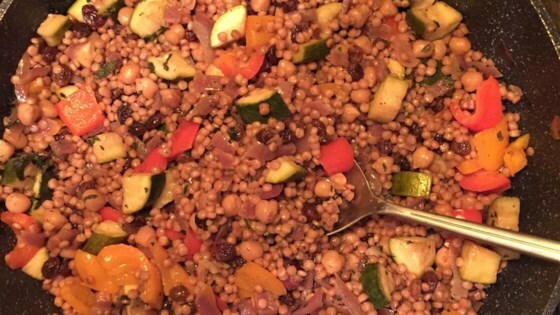 Next time I would decrease the broth and couscous to 1 cup each, though - i thought there was a little too much of the couscous compared to the veggies.